Our modern lifestyles often cause us to spend more time sitting behind a desk than being active outdoors. At the same time, our general health is deteriorating. The alarming rise in obesity, sedentary lifestyles and mental ill-health across the developed world has resulted in an urgent desire to understand how the environment, in particular the outdoor environment, influences health. This book addresses the growing interest in salutogenic environments - landscapes that support healthy lifestyles and promote well-being – and the need for innovative methods to research them. Drawing on multidisciplinary approaches from environmental psychology, health sciences, urban design, landscape architecture and horticulture, it questions how future research can be better targeted to inform policy and practice in health promotion. 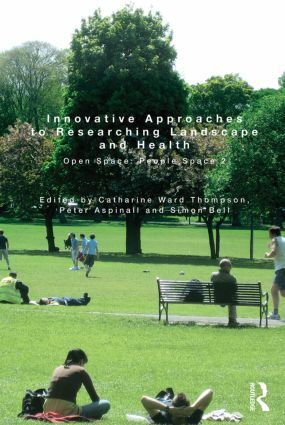 The contributing authors are international experts in researching landscape, health and the environment, drawn together by OPENspace directors who have a unique reputation in this area. This pioneering book is a valuable resource for postgraduate researchers and practitioners in both environmental and health studies. Catharine Ward Thompson is Professor of Landscape Architecture at the University of Edinburgh. She is Director of OPENspace research centre, based at Edinburgh and Heriot-Watt Universities, and directs the Landscape Architecture PhD programme at Edinburgh. Peter Aspinall is Associate Director of OPENspace Research Centre and is an environmental psychologist. He is currently an Honorary Fellow of the University of Edinburgh and Emeritus Professor of Vision and Environment at Heriot-Watt University. Simon Bell is Associate Director of OPENspace Research Centre, University of Edinburgh and a forester and landscape architect. He is also Professor of Landscape Architecture at the Estonian University of Life Sciences, Tartu, Estonia.